M. C. Russell was the father of J. Barbour Russell. Read more about J. Barbour here. Read more about M.C. here. It opened November 25, 1932. Kentucky Business ran a feature story about Carnation in 1950, here. Story of Carnation, in Maysville, from 1935, is here. The pictures in this set are all from inside the Carnation Dairy in 1946. “The Union Coal Oil Company‘s refinery, at Maysville, Ky., was partially destroyed by fire this afternoon. Loss heavy in oil; insurance unknown.” New York Times, July 18, 1866 “Claude Watkins, owner of the Whitehall Hotel, purchased the Central Hotel today and these two hotels will be consolidated, forming on of the largest hotels in Eastern Kentucky.” Louisville Courier Journal, April 23, 1923. In 1872, bad weather could mean you didn't eat. Details. Then there was the guy that tried to start a nitroglycerin factory in Maysville. Details. Followed closely by this law from the Kentucky Legislature. on the east side of Lexington, between 2nd and 3rd. Learn about a boiler explosion at Hall's, here. The Pogue Distillery, recently re-opened, has a history if its business at its web site. made by Maysville's Ohio Valley Pulley Works, which opened in 1896. A little more on the Ohio Valley Pulley Works, from 1910, is here. An item from 1935 is here. Thomas L. Ewan, Real Estate & Farm Lands John O'Keefe, Toys & Confections Fitzgerald Saddlery, Wholesale Saddles Rain Brothers, Grain, Flour, Seeds, Etc. Henry S. Gallenstein, General Blacksmith Leonard & Lalley, Ranges, Stoves, & Tinware John Armstrong & Son, East End Druggists W. F. Power, Stoves, Ranges, Tinware, Etc. The Gable Brothers, Coal, Salt, Sand, etc. 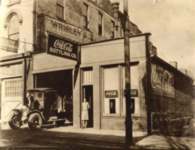 George Dye, Old Time Merchant Frank Devine, Real Estate Agent Bauer & Klipp, Buggies, Harnesses, Etc. T. Dickson, Livery & Feed John T. Smith, Cigar Company Barkley's Shoe Store The Kentucky, A Bottling Company, James Summers, prop. J. H. Pollitt, Golden Rule Grocery Lane & Easton, Contractors & Builders Charles W. Conrad, Staple and Fancy Groceries The Navarre Cafe,C. E. Martin, Prop. F. F. Gerbrich, Piano's, Phonographs, etc. John W. Porter, Funeral Director The Racket Store, L. H. Young & Co. The Art Shop, W. D. Oldham, Prop. How Maysville's G. W. Geisel sold catchup.